The press centre of the antiterrorist operation HQ completes operation. One Ukrainian serviceman was wounded and one sustained combat injury amid 47 shooting attacks on 29 April, the press centre of the antiterrorist operation (ATO) HQ has said. In the Luhansk sector, the Russian occupying troops fired with banned 122-mm artillery at ATO strongpoints near Prychepylivka, 82-mm mortars near Novozvanivka. They also used 82-mm mortars, grenade launchers of various systems and an air defence system near Novhorodske, and small arms twice near Stanytsya Luhanska. 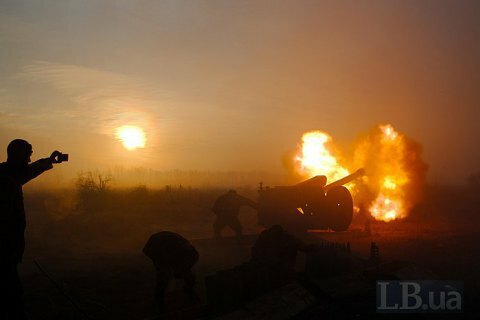 In the Donetsk sector, they fired with 82-mm mortars, grenade launchers, heavy machine guns and small arms at the defenders of Avdiyivka and the Butivka mine. They targeted Vodyane, Maryinka, Krasnohorivka, Pavlopil, Opytne, Kamyanka, Shyrokyne, Pisky, Nevelske and Lebedynske with grenade launchers, heavy machine guns and small arms. An antitank missile system was used near Vodyane. Today is the last day of the ATO HQ press centre operation as the ATO ends and the Joint Forces Operation begins.